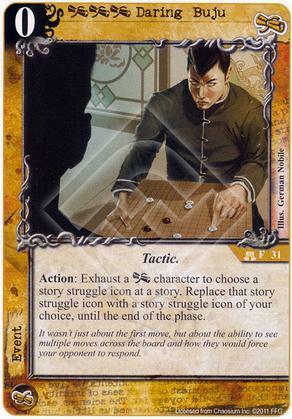 Flavor Text: It wasn't just about the first move, but about the ability to see multiple moves across the board and how they would force your opponent to respond. I still haven't found out what a "Buju" is supposed to be. Anyone know? I found 2 things, a jewish buddhist (http://en.wikipedia.org/wiki/Buju), and a sort of clothing (http://www.fotosearc...5/03157ap10088/, http://www.kamdaronl...roducts_id=1560). Hmm, he doesn't seem to be wearing that sort of outfit, and he doesn't appear to be of Jewish descent either. Also it's not a character card, so I've been suspecting the term Buju refers to an action or strategy or something like that and not necessarily the person. It doesn't appear to be Go terminology either (he is pictured at a Go board). According to the Wikipedia article for "Bu ju" its a Chinese story about a guy who visits an oracle. Apparently literally it means "Divination." So maybe its not a specific go move but rather just this fellow boldly predicting what his opponent is going to do and counteracting him far ahead of time. Ah, I didn't think of trying to split buju into two words. So maybe that's it then. We all know though that it is a euphemism for "mojo". I'm a Chinese. Buju is the Chinese Pinyin of "布局". Buju means the opening layout of Go. The man didn't place the stones on the star points as usual in the opening layout.